Home Latest News & Updates at Leisure Lakes Bikes Buying A Bike–You Can Trust Us! Buying A Bike–You Can Trust Us! We know that buying a bike online can be a bit daunting, which is why we do everything we can to make ordering your new bike online quick and easy! We offer FREE UK delivery or FREE Click + Collect to any of our 10 UK stores with every bike you buy online. Every bike we sell (online & in our stores) comes with a FREE bike check/tune up of your bike from our Cytech qualified mechanics. This is a great way to touch base and make sure everything is running correctly on your bike after you’ve been out on it a few times. We will send you a reminder to get your bike booked in for it’s free safety check a few weeks after your purchase and this is valid for up to 6 months after your purchase. What’s included in your free bike check? With every bike purchased from Leisure Lakes Bikes we are giving you 8 WEEKS FREE bike insurance to keep you covered in the first few weeks of you enjoying your bike. How Does My Bike Arrive In The Post? 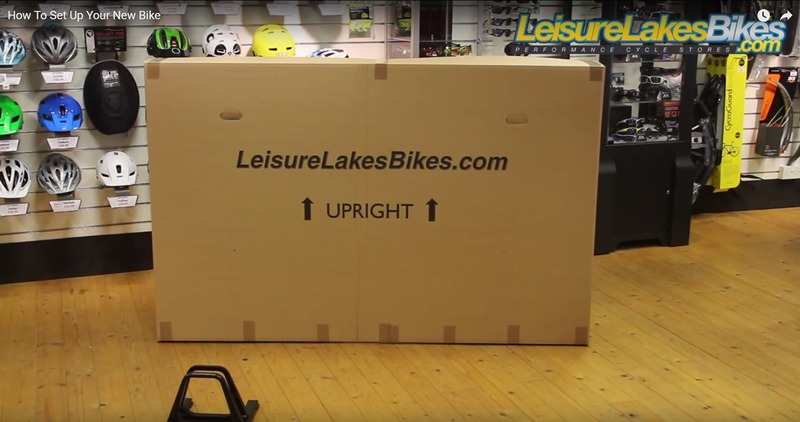 Every bike we sell is built, tested and packed securely in one of our special Leisure Lakes Bikes boxes by a Cytech qualified mechanic. This PDI (pre-despatch inspection) is our way of checking everything is set up correctly and safely for you. We do have to make a few adjustments when packaging your box, but don’t worry, we include all the tools and instructions you need to get your bike ready to ride and we’ve put together this handy video for you too. All you have to do is turn the handlebars and put on your pedals and you’re ready to ride!